Cooking with spruce is magical. It fills up the house with the fragrance of a sweet-scented forest and makes it feel oh so Christmassy! I liked the idea of borrowing a few snips from my Christmas tree’s branches, whipping up a batch of these tree cookies, and putting them right back on the tree. I’ve been making spruce shortbread for a while but was never quite satisfied with the faint, barely perceptible flavor. 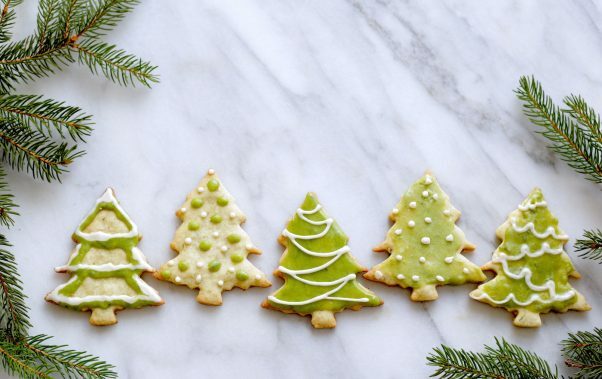 Then I happened on Gather Victoria’s enticing recipe for a spruce cookie glaze and lo and behold, the vibrant green icing transformed my cookies from shy to bold, now bursting with the aroma and color of a majestic spruce! 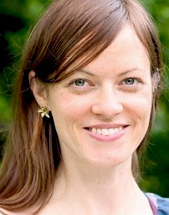 Her post also inspired me to sip on some spruce needle tea as I recently nursed a nasty cold. I’m quite sure it was the tree’s bountiful medicinal properties that got me back on my feet. Thank you trees for all the joy and health that you bring us, particularly at this time of year! If you’re in the mood, strap your boots on and go for a walk in the woods to gather the needles that make these shortbread cookies so special. While most conifer needles are edible, a few varieties are toxic so be sure to use a tree identification guide. For instance, the Yew tree and Norfolk Island Pine (sold as ornamental trees) are poisonous, and cedars and Ponderosa pine are known to have some toxicity). It’s also important to be aware that some sources recommend pregnant women should avoid consuming spruce. But with these precautions in mind, you can take a taste walk through the woods, sampling the needles of fir, pine, and spruce to determine which you like best, knowing that conifers have been used for food and medicine since time immemorial. Spring is the optimal time to harvest spruce needles, when their tender delicate green buds appear. But I’ve found that the more mature, wintery spruce needles can be equally delicious, with a more full and complex taste profile. 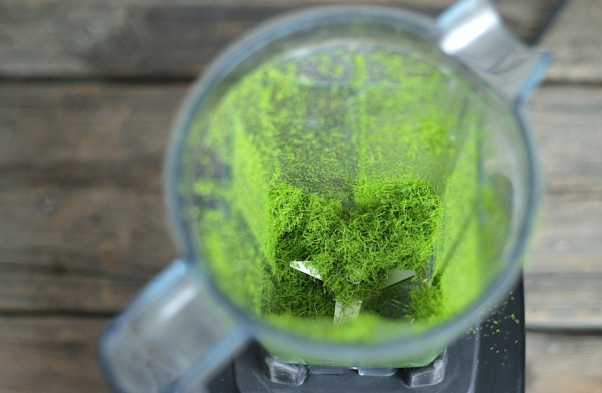 And when you grind them up into a moist, bright green powder, you can almost feel their vitality and the beauty they can bring to any recipe! These cookies are lovely to gift. Or if you wish, gift your tree back to itself by decorating it with a bit of its own essence. May your home be filled with magic, light, and wonderful aromas at this very special time of year. Happy holidays! Cooking with spruce is magical. It fills up the house with the fragrance of a sweet-scented forest and makes it feel oh so Christmassy! 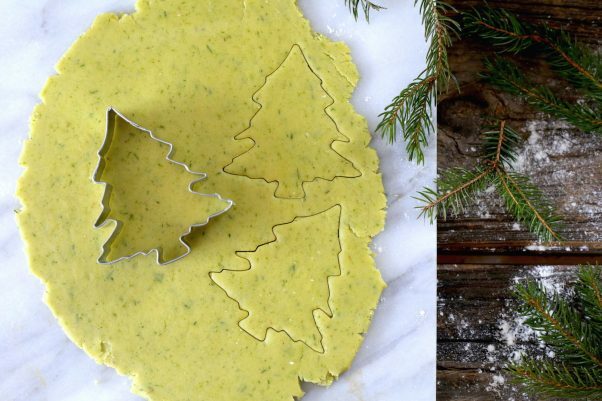 These spruce tree shortbread cookies are also a lovely gift. Read about Aube Giroux's inspiration for this Christmas dessert on Kitchen Vignettes. To make the cookies, In a coffee grinder, food processor, or vitamix, grind the spruce needles until bright green and powdery. Add the sugar, and grind until the sugar is powdery and the spruce powder is integrated with the sugar. You may need to stir with the end of a wooden spoon between grinding to keep the spruce powder from clumping in the corners. Beat the room temperature butter. Add the spruce sugar and beat until smooth. Stir in the flour until incorporated (don’t overmix). (If your dough feels overly dry, add a scant teaspoon of milk). Roll the dough into a ball, flatten into a disc, wrap and chill in the fridge for one hour, or up to 24 hours. (The longer the better, as this will give your dough time to absorb the spruce flavor). Preheat the oven to 350F. Roll out the cookies to 1/4 inch thickness on a floured countertop. Cut into shapes with a cookie cutter and transfer to a parchment paper-lined baking sheet. Bake at 350F for about 8 to 10 minutes or until edges turn slightly golden. Allow cookies to cool completely before icing. To make the icing, grind the spruce as you did for the cookies but mix the powdered sugar and spruce powder together by hand. Add the milk, 2 Tbsp to begin. Mix well. Add more milk, a teaspoon at a time, until the icing has reached a smooth and spreadable consistency. 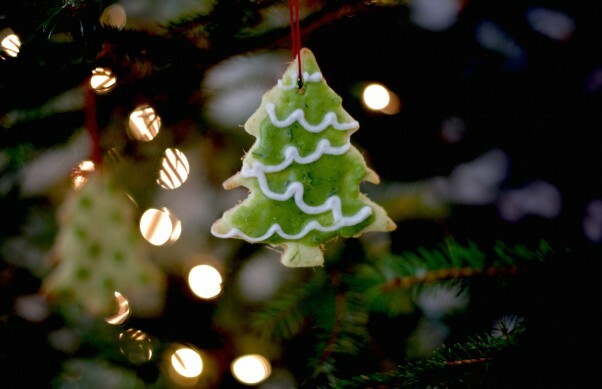 Decorate the cookies with the icing and serve, or hang on your tree! Cookies will keep for about a week in a cookie tin kept in a cool place. Some important words of precaution: *Some sources recommend that pregnant women should avoid consuming spruce needles *Please be sure to use unsprayed wild trees when cooking with spruce needles. Many commercial Christmas trees are sprayed with pesticides and some are even sprayed with toxic flame retardants. *When foraging for spruce, please be sure to use a reliable tree identification guide. It’s important to be aware that although most conifers (pine, spruce, and fir) have edible needles, there are a few toxic varieties to be aware of, for instance, the Yew tree is toxic to humans, as is Norfolk Island Pine which is sold as an ornamental tree, cedar and Ponderosa pine are known to have some toxicity.